On Wednesday night, I had the honor of teaching at a wonderful church in Tucson, Arizona. It is shepherded by Pastor Robert Furrow. When I had first accepted in the invitation last fall, I had intended to teach about “The Future of the Middle East In Light of Bible Prophecy.” But in the meantime, Robert’s dear wife, Lisa, went home to be with the Lord after a very difficult battle with cancer. Having been to Tucson numerous times over the years to teach with and for Robert and Lisa, and having built a sweet friendship with them both, and having prayed for the Lord to let this cup pass from them both, I was so saddened when I got the news. It was hard to fathom such a strong and faithful woman of God was gone. I was happy for her — she is well and whole and worshipping in the presence of Jesus. But I was grieved for Robert and his family and his congregation. It was an honor, therefore, to be out there this week. I was glad to be able to spend time with Robert, and pray with him, and listen as he shared with me the hard road he’s been on since the Lord took Lisa home to heaven. In that context, I didn’t feel I was supposed to teach about the Middle East. 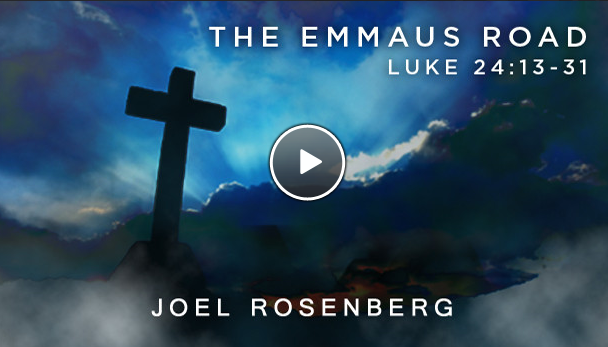 Rather, I felt moved to teach about the two Jewish disciples on the road to Emmaus, about their sadness and their confusion and their deep sense of loss, perhaps even betrayal, when the man they thought was the Messiah was betrayed, arrested and crucified. Here is the link to the audio and the video of the message. I hope you and your family will take some time to listen to the message and share it with others. And may the Lord bless you, and comfort you, and encourage you this Passover and Easter season. Game-changer: Israeli natural gas began flowing today. Dawn of “energy independence.” Prophetic, too? UPDATED: Israeli Prime Minister Benjamin Netanyahu announced this weekend that the dawn of Israeli “energy independence” has arrived. Today, for the first time in history, Israeli natural gas is being pumped out of the Mediterranean Sea and back towards the Jewish state. Soon, the Jewish state will no longer need to import energy, thus making Israel more financially independent and in turn enhancing her national security. What’s more, if it chooses to, Israel will soon also be able to export natural gas to Europe, a move that could make Israel enormously wealthy and become a game-changer economically, geopolitically and perhaps prophetically. Readers of The Last Jihad novel series may recall that the plot — Russia and Iran form a military alliance and seek to attack Israel, a move that triggers the “War of Gog and Magog” that was prophesied in Ezekiel 38-39 — was premised on two key prerequisites: 1) Jews “living securely” back in the Land of Israel after centuries in exile; and 2) Israel becoming so wealthy that the leaders of Russia (Magog) would seek to plunder the Jewish state. In the novel series (which was first published in 2002), I created a fictional scenario in which Israel discover massive amounts of petroleum and become a regional economic superpower, thus drawing Russia’s attention, and the greed of the leaders in the Kremlin. Back then, many people scoffed at the notion that either of these prophetic prerequisites could ever come true, particularly in our lifetime. So in my first non-fiction book, Epicenter (published in the fall of 2006), I laid out the research behind my novels. Noting that Israel was already far more prosperous than her immediate neighbors — including the Palestinians, the Egyptians, the Jordanians, the Syrians and the Lebanese, I argued that it was possible that the Israel could become far more prosperous due to a series of Bible prophecies which indicate that Israel will make major discoveries of petroleum in “the last days.” IN Chapter 5 of Epicenter, which was entitled, “FUTURE HEADLINE: ISRAEL DISCOVERS MASSIVE RESERVES OF OIL, GAS,” I explained the prophecies and how they could come to pass in the future, possibly in our lifetime. 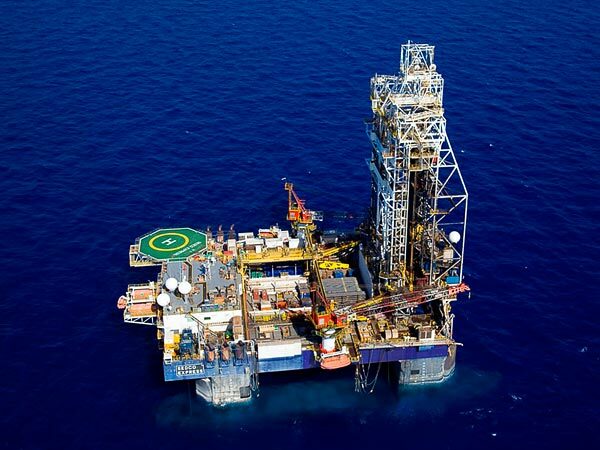 “Natural gas from the offshore Tamar field was pumped to Israeli shores for the first time Saturday, four years after its discovery, in preparation for its first use in the Israeli energy market — a move that could transform the Israeli economy,” reports the Times of Israel. “The Tamar deposit, discovered in 2009 some 90 kilometers west of Haifa, holds an estimated 8.5 trillion cubic feet of natural gas. Curiously, the Russians are already eyeing Israel’s new gas discoveries and wanting a piece of the action (see articles below). Bottom line: While it is too soon to conclude definitively that we are seeing events line up for the fulfillment of Ezekiel 38-39 in our lifetime, the discovery, development, and pumping of natural gas is certainly an historic moment for Israel. It will be a great blessing to the Jewish people, to be sure. But it also could draw enemies who will try to attack Israel’s burgeoning natural gas industry and choke Israel economically. Could Russia conceivably become one of those enemies? Only time will tell, but it’s worth noting that Russia certainly views itself as a superpower in the natural gas market, and is currently the biggest supplier of natural gas to Europe. 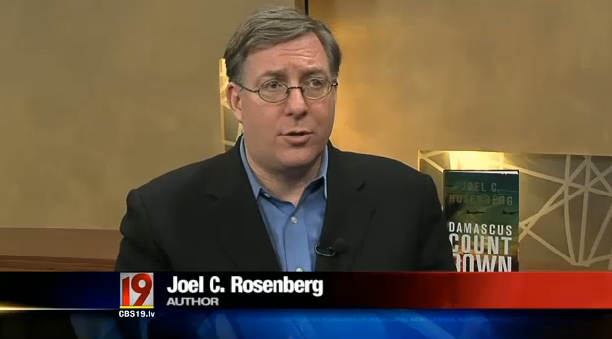 Talking about Israel on Channel 19 in Tyler, Texas. For the last several days of the Damascus Countdown book tour, I’ve had the honor of traveling through Texas to talk about the latest threats rising in the Middle East, and to ask Texans to pray for the peace of Jerusalem, as we are instructed to do in Psalm 122:6. On Friday, I traveled to Austin to meet with Texas Governor Rick Perry and Congressman Louie Gohmert. For nearly 90 minutes, we discussed the President’s trip to Israel and Jordan and how Texans can stand with the State of Israel at this critical time. On Saturday, I was in Tyler to speak at a brunch and dinner about events in the Middle East, and to do interviews with three local TV stations. On Sunday, I spoke at both morning services at Green Acres Baptist Church, one of the largest congregations in the country with some 15,000 people attending. There I spoke on Matthew 20 & 21 and Jesus’ trip from Jericho to Jerusalem, His healing of two blind beggars in Jericho, and His entry into Jerusalem on Palm Sunday morning. On Monday, I did media interviews from Dallas, before heading to Tucson, Arizona where I will speak tonight at Calvary Tucson. Go — visit Israel and show your solidarity with the Jewish and Arab people there (I’m leading a “prayer & vision tour” to Israel this summer — from June 25 to July 7 — and holding the 2013 Epicenter Conference on July 5th; please come with us — there is still space available). >> Video: Discussing Obama trip, an Israeli first strike & “Damascus Countdown” on Hannity show. To learn more about Damascus Countdown — currently on the New York Times, Washington Post, Publishers Weekly and USA Today bestseller lists — please click here. Damascus Countdown hits NYT best-seller list for third week. We just got the news that Damascus Countdown will remain on the New York Times hardcover fiction best-seller list for the third week. In the Times’ “Book Review” section published on April 7th, Countdown will be positioned at #11. The novel — which explores an Israeli first strike against Iran’s nuclear facilities and the blowback that comes from Iranian and Syrian retaliation — has also hit the USA Today and Publishers Weekly, best-seller lists. Thanks so much to everyone who is enjoying the book and posting their reviews on Amazon, B&N, Facebook, Twitter and elsewhere. 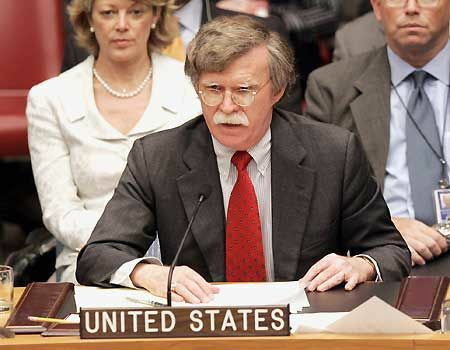 John Bolton served as the U.S. ambassador to the U.N. under President George W. Bush. (Dallas, Texas) — Judging from the televised images, President Obama’s first state visit to Israel was a love fest. The Israelis literally and figuratively rolled out the red carpet, even giving Mr. Obama a medal to thank him for his friendship to the Jewish people. The President, in turn, literally and figuratively hugged Israeli Prime Minister Benjamin Netanyahu and repeatedly called him by his nickname, “Bibi,” as though they had been best pals for years. The days of frosty, even frigid, relations between the two leaders seemed over. But John Bolton isn’t buying it. The long-serving American diplomat and national security expert, who served as the U.S. Ambassador to the United Nations under President George W. Bush, says behind the scenes there is still trouble in paradise. I interviewed him by phone yesterday and his message was crystal clear. On the three critical issues facing the U.S. and Israel in the Middle East — dealing with the Iran nuclear threat, the implosion of Syria, and the peace process — Bolton says the President’s objectives have not changed one iota. Netanyahu cannot count on this White House, he argues. And if Israel is going to strike Iran, they’re going to have to do it this year, and on their own. What’s your assessment of President Obama’s trip to Israel? Bolton: I think the President had two objectives. One was political, to try to smooth over some of the differences in the relationship with Israel in general, and with [Israeli Prime Minister Benjamin] Netanyahu in particular. The other purpose was to have substantive, private discussions with the Israeli leadership to tell them not to even think about using military force to stop Iran from building nuclear weapons, and pressure them to make more concessions to the Palestinians. I think the President accomplished the political objective the moment he stepped off the plane, embraced Netanyahu, and visited the Dead Sea Scrolls and [Zionist leader Theodor] Herzl’s tomb, and made all his other public stops. It was a cosmetic effort to stem some of the criticisms he’s been taking in recent years, and on that level it was somewhat successful. But while the optics may have improved, the fundamental differences remain exactly what they were. I don’t think Obama changed his positions, or softened his positions. I think he remains just as committed to preventing an Israeli first strike against Iran’s nuclear program, and to creating a Palestinian state very much along the ’67 borders with minimal changes. Some analysts – including some conservatives – have suggested that the President retreated somewhat by not insisting that Israel stop building settlements as a precondition to direct negotiations with the Palestinian Authority. But I don’t see it that way. I think that’s a tactical decision that isn’t that important. The point, for Obama, is to get the talks [between Israel and the Palestinians] going again, because once negotiations begin, Obama knows he will be free to pressure Israel to stop building settlements and to make more land concessions. So I didn’t detect any real substantive change on the settlements issue. So back to the Iran issue, just to be clear, you don’t believe the President gave Netanyahu a “green light” to hit Iran. To the contrary, you believe he is continuing to pressure Israel not to strike? The calculus that Obama leaves with Netanyahu is that the U.S. won’t really back Israel if he orders a first strike. There is an implied threat here, that if Israel uses military force, that we will not will have their back, that we will not resupply them with planes or other weapons, that we will not help them if they’re attacked by missiles from Hezbollah and Hamas, and so forth. This is a critical factor for an Israeli Prime Minister to weigh, the possibility that Israel wouldn’t have full U.S. assistance in a major regional war. Now, I don’t think Obama could sustain that position because of strong Israeli support in Congress and in the public. Polls are showing the American people actually support military action against Iran’s nuclear program. But it’s challenging for Israeli leaders because there could be a window of vulnerability if there is a sharp disagreement inside Washington over whether and how to help Israel during such a conflict. How much time does Israel have to make a final decision about going to war? Bolton: Time is growing short. Iran may be developing facilities we don’t know about. I think this is the year of decision. If the Israelis don’t act now, they’re not going to have as advantageous an opportunity in the future as they do now. I think they’re running out of time. What Netanyahu is not going to do is rely on the U.S. to take care of this. If you asked Israel, they would prefer the U.S. to take action, of course. It’s the difference in capabilities that drives the different views of timing. The U.S. has much more capability to set Iran’s nuclear program back for much longer. That’s why the White House doesn’t feel the same sense of urgency that Israel feels. Personally, I would have attacked years ago because you set the program back further when Iran doesn’t have all the knowledge and materials to build a Bomb. I think the Prime Minister has until the end of the year to strike. If he doesn’t do it by the end of the year, then I think it will move beyond Israel’s capabilities. One more question, on Syria. How do you assess the situation in Syria, and what should the U.S. be doing there right now? Bolton: It’s a very dangerous situation. The highest priority for the U.S. is to make sure Syria’s chemical and biological weapons don’t get used, and don’t get transferred out of the country into the hands of state sponsors of terrorism or terrorist groups. This is a priority we share with Israel, Turkey, Jordan and with every friendly country in the region, of course. But it’s very difficult to do. As we’ve seen, there are conflicting reports about whether the rebels or the regime may have used chemical weapons in recent days. I would not vouch for the safety of Syria’s chemical and biological arsenal. It’s a very dangerous moment. As for helping the rebels, look, we have not yet been given the name of a single Syrian opposition leader whom we can trust to not to unleash a bloodbath if he gets into power, and destroy Syria’s stockpile of chemical weapons, and stabilize the country. The opposition is fragmented and divided, so I’m not optimistic that we can do much to help at the moment. Video: Discussing Obama trip, an Israeli first strike & “Damascus Countdown” on Hannity show. 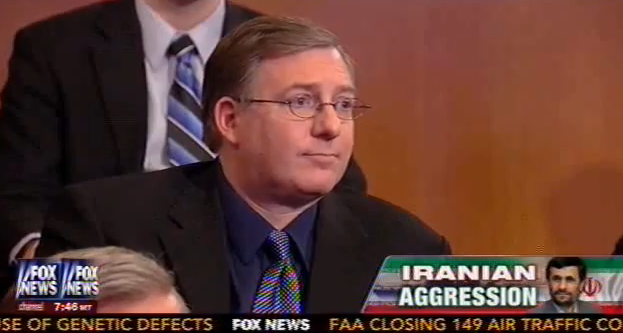 Appearing on the primetime Mideast special on Fox News. Chag sameach! To all my Jewish family and friends & to the nation of Israel, may the Lord bless you this Passover season. Next year in Jerusalem! Better yet, this year in Jerusalem! Come with me and The Joshua Fund to Israel and the 2013 Epicenter Conference this summer. On Friday night, Sean Hannity broadcast a special on the President’s trip to Israel. He interviewed a panel of Congressmen and Mideast experts, and I was honored to be included. Hannity: Joel, you have written — from The Last Jihad straight on through — you have written a lot of novels, and every time I read them, I’m thinking these scenarios seem very possible to me. You have a very dark, twisted mind. Rosenberg: I’m looking at worst-case scenarios,. Hannity: But it could happen…. Here’s the link to the video of my discussion with Sean. We talked about Damascus Countdown and it’s parallels to current events in which an American president tries to pressure Israel not to launch a preemptive strike against Iran’s nuclear facilities, but Israel strikes anyway. Satellite image of alleged nuclear and missile facility in Iran, about 15 miles northwest of the Fordow facility near Qom. “Iranian scientists are working on nuclear warheads — and trying to perfect them – at an underground site unknown to the West, according to a high-ranking intelligence officer of the Islamic regime,” reports Reza Kahlili. A former Iranian Revolutionary Guard Corps officer, Kahlili joined the CIA and became a double agent against the Iranian regime during the 1980s and ’90s. On March 21st, I shared with you his report. While I cannot independently verify his allegations or the details that he presents in the report, or in his Washington Times oped, I do believe it is important to make readers aware of this information so that it all can be thoroughly analyzed and assessed. 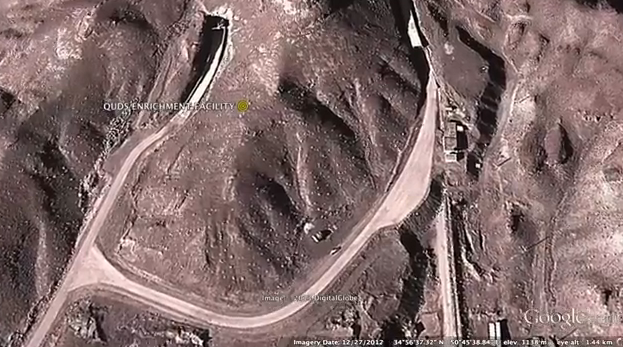 Now, Kahlili has released a 2:34 minute video on YouTube that provides satellite images of the alleged Iranian nuclear weapons and ballistic missile facility. The nuclear site is located about fifteen miles northwest from the Fordow nuclear site near Qom, Iran. It is larger than Iran’s Fordow and Natanz nuclear facilities combined. It includes a facility where Iran is developing nuclear warheads. There are over 380 missile silos at the site. An airport has been built nearby. The site is linked to a large electrical power lines. The site is surrounded by barbed wire fences and security towers. The video is worth watching, and sharing with others. If the information is accurate, this would suggest that Iran may be at — or may have crossed — the “red line” and is on the verge of completing operational nuclear warheads and the missiles to deliver them. 64% of Americans support military action to prevent Iran from getting nuclear weapons, finds new poll. Pew Research Center Poll, March 2013. The big question that remains after President Obama’s trip to Israel and Jordan last week is this: Has the U.S. given Israeli leaders the “green light” to launch military strikes to neutralize Iran’s nuclear program before it’s too late? In Damascus Countdown, I portray a scenario in which an American president does not want Israel to strike, but Israel launches the attack anyway. Iran then retaliates, and draws Syria into the War of Annihilation against the Jewish State. In real life, the White House has been putting enormous pressure on Israel not to hit Iran, though some analysts are speculating that perhaps President Obama has softened that position and may have, in fact, signaled his assent to Netanyahu to do what was necessary. What’s interesting is that should military action be needed, a new poll finds that nearly two-thirds of the American people are in favor, including 62% of Democrats. To be clear, ten years after the Iraq war, Americans do not want another war in the Middle East. But strong majorities do support military action against Iran if absolutely necessary. 12% volunteers that they sympathize with neither side. 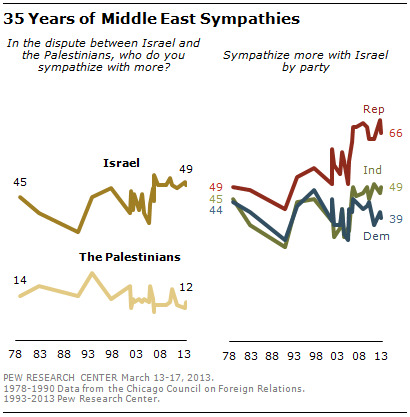 One element of the poll concerned me, however — young people have far less sympathy for Israel that older Americans. Clearly, we will need to do much more to educate young people about why Israel is so important and why we should support and bless Israel and the Jewish people. 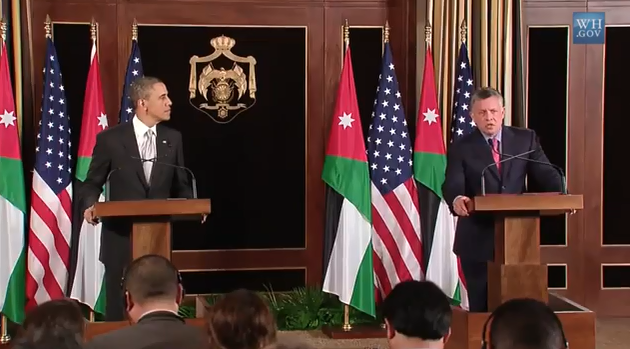 On trip to Jordan, President Obama & King Abdullah II warned of dangers posed by implosion of Syria & Iran. >> NOTE: I’m looking forward to speaking at the Calvary Tucson evening services this Wednesday night. Please join us if you can. Jordan’s King Abdullah II needs our prayers. He is a man trying to lead his country into a more peaceful, prosperous and democratic future. But he faces extraordinary challenges — the implosion of Syria to the north and the possibility of an Israeli-Iranian war are just two, but they are the most urgent at the moment. “But Obama, speaking inside a cavernous dark-wood hall alongside the king, also raised the question he said preoccupies his administration regarding Syria,” noted the Post. “His concern is how the fighting, which has killed an estimated 70,000 people, will shape the religious and cultural makeup of a long-repressed nation. He warned that Syria could become a beachhead for Islamist extremism, adding “that is why the United States has a stake” in the war’s outcome. Abdullah, too, warned that the increasing sectarian cast to the war threatens to pull the country apart. Asked by a Jordanian journalist why ‘the leading superpower’ does not intervene in Syria, Obama suggested that the unpredictable nature of the civil conflict has left him no policy option that would guarantee more good than harm, either through a direct military strike or by arming Syrian rebels. 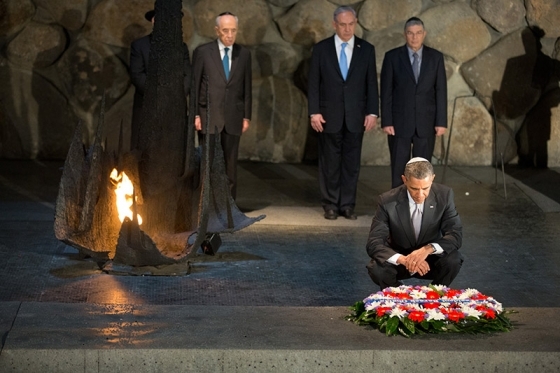 “Next up was a tour of Yad Vashem Holocaust Memorial Complex, where President Obama honored the memory of Holocaust victims by laying a wreath and rekindling the eternal flame in the Hall of Remembrance. He also joined Israeli President Shimon Peres and Prime Minister Netanyahu on a tour that included the Hall of Names, a circular chamber that houses the original testimony documenting every Holocaust victim ever identified, and the art museum where the President heard the story of Charlotte Salomon, a Holocaust victim who was murdered in 1944 in Auschwitz, but whose memory is preserved in the autobiographical artwork she painted while in hiding from the Nazis. The President ended the poignant visit with a walk through the Children’s Memorial, which memorializes the 1.5 million Jewish children who perished during the Holocaust with candles reflected in a series of mirrors.